Wayne Community College will have the extraordinary experience of hosting the regional competitions of two major student organizations this spring. The college is hosting the North Carolina Technology Student Association (NCTSA) Eastern Region Conference on Friday, February 8 and the SkillsUSA North Carolina East Regional Rally, on Friday, March 8. This is WCC’s first time hosting either event, and to get both in one year is unprecedented. 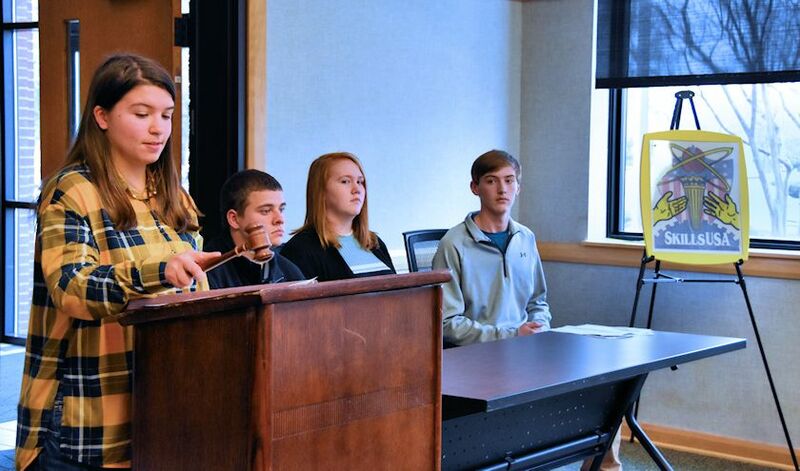 The NCTSA event, with a theme of “Model the Way,” will bring 324 students from 19 middle schools and 16 high schools east of Guilford County to compete in 35 events. Competition is one of the major components of the TSA. Each school year, regional, state, and national competitions are held, with each level becoming more difficult. “The Eastern Region North Carolina Technology Student Association Conference provides students with the opportunity to test their skills through hands-on technology, engineering and design challenges and problems,” explained Dr. Jerianne Taylor, NC Technology Student Association State Advisor. 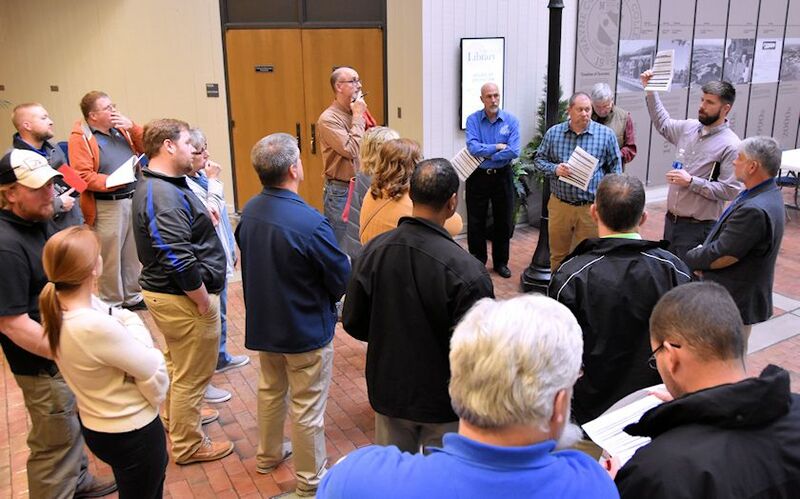 SkillsUSA State Director Peyton Holland (far right with hand raised) talks to chapter advisors during a tour of the college. SkillsUSA will hold its East Regional Rally at WCC on March 8. Around 400 high school students from the Triangle to the coast are expected to compete in 68 events during the SkillsUSA Regional Rally in March. He said that the last few years, the east regional rally was the largest regional event in the state and it typically draws competitors from other areas of the state. 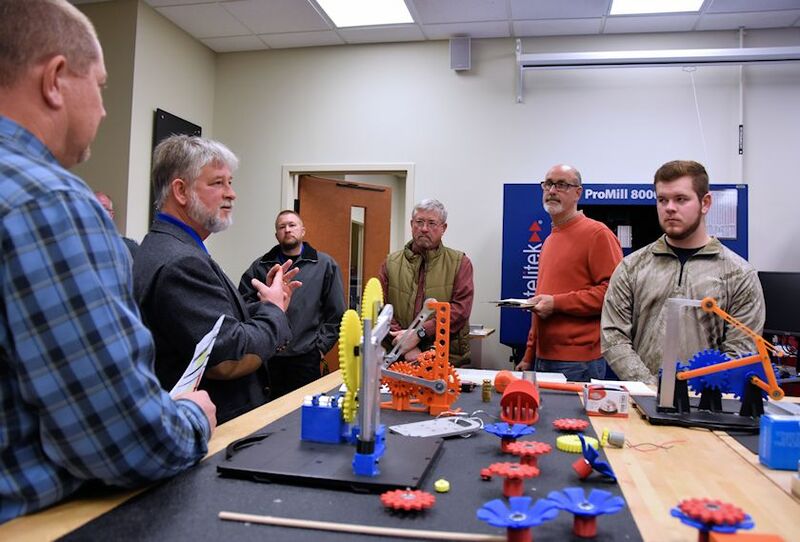 Steven Thorne (far left) and Dr. Ernie White (second from left) show SkillsUSA chapter advisors a lab during a tour of Wayne Community College in preparation for their East Regional Rally there on March 8. The SkillsUSA rally at WCC is the last of five regional rallies being held across the state. At these rallies, students compete in a variety of leadership and skill contests, participate in leadership development workshops, and explore the programs at the host colleges. Both events will utilize spaces across the campus and employ college faculty and staff as judges. Staff will be creating medallions for the first through third place awards for the TSA competitions. “We want the students to have a good experience,” said White. SkillsUSA North Carolina Eastern Region president Bailey Brown practices gaveling open the upcoming rally. She and the other officers were preparing for the event at WCC on March 8. TSA is a national, non-profit organization of middle and high school student members who are engaged in STEM. Since TSA was chartered in 1978, almost 4,000,000 members have participated through competitions, intracurricular activities, leadership opportunities, and community service. SkjllsUSA is a nonprofit partnership of students, instructors and industry striving to ensure that America has the skilled workforce it needs to stay competitive. Endorsed by the U.S. Department of Education, the association serves more than 360,000 member students and instructors each year in middle schools, high schools, and colleges. This diverse talent pipeline covers 130 trade, technical and skilled service occupations, the majority STEM-related. More than 600 corporations, trade associations, businesses and labor unions actively support SkillsUSA at the national level. SkillsUSA supports its student members through the development of SkillsUSA Framework skills that include personal, workplace and technical skills grounded in academics. Local, state and national championships, designed and judged by industry, set relevant standards for career and technical education and provide recognition opportunities for students. SkillsUSA also offers technical skill assessments and workplace credentials through the Career Essentials program, a cutting-edge solution that defines, implements and measures career readiness skills for students. For more information: www.SkillsUSA.org.